Irish brogue and Celtic roots. 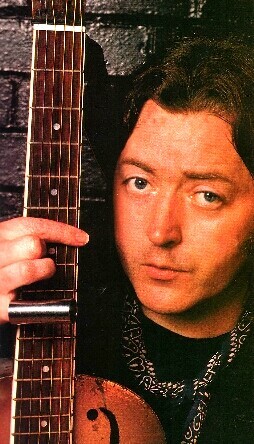 Rory Gallagher – the former Taste Kingpin has taken the Blues to new realms over a string of critically acclaimed albums. ALL-ROUND Irish gentleman and veteran Blues campaigner, Rory Gallagher, suddenly feels comfortable with the current musical climate. Through the ‘60s, fronting Irish trio, Taste, and the ups and downs of the two decades that followed, Rory has weathered the roughest storms and emerged only to see current trends turn full circle in his favour. While Rory is unlikely to rearrange the sorry state of Pop as we know it, 1990’s ‘Fresh Evidence’ contains enough Blues-soaked gems to set even the most heathen of toes a ‘tappin’, drawing on a genuine love of the genre rather than any misguided attempt to jump on the tailboard of the Blues boom bandwagon. Spontaneity itself is a key word with Rory and it’s borne out during the recording of ‘Fresh Evidence’. Till then Rory will keep authentically etching into his fret board. The fire that drives him is known as sheer love.